All you marketers that are felling pretty good about the program you have conceived and built for inbound marketing...prepare to get pretty nervous. Complete with HubSpot data no less. Did you realize that 1 of every two babies born in the US today is Latino? And there is no such thing as Latino marketing - there are different languages (Spanish & Portuguese), a myriad of dialects, vastly different cultures, and uneven geographic distribution. So even if you have some Spanish language inbound marketing, don't feel to smug. Your content needs to be even more nuanced. And how about inbound marketers who will try to out market you? Is your marketing good enough (with a broad enough foundation of multi-channel super duper content) to resist the coming influx of Chinese inbound marketing? Let's imagine, for a moment, that you are a content marketing superhero. What market share can you reasonably expect to reach? And is a growing market share of a shrinking (or stagnant) market a pyrrhic victory? Maybe diversification makes sense. Any idea where the world's growth is happening over the next 10 years? 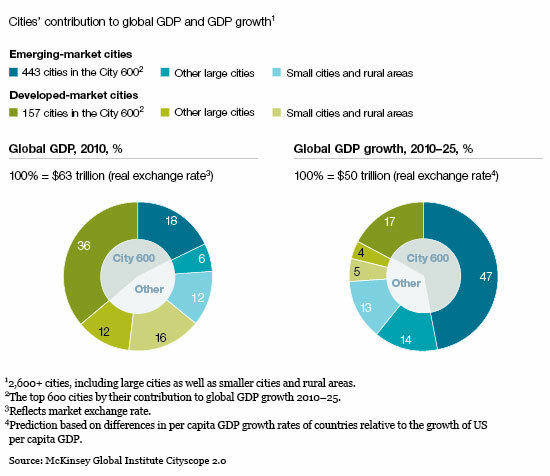 Let's take a look at what McKinsey projects. It's coming from emerging markets. And what's important to understand about marketing into those markets? Here's an excerpt from a recent GlobalWebIndex study reported by Warc. "Digital channels are more important for marketers than traditional media when it comes to connecting with consumers in emerging markets, new analysis has revealed." Among other key facts, Social Media is SIX TIMES more important and mobile campaigns are up to FOUR TIMES more effective. What's it all mean for you? Fair question. Probably 4 key points. B2B & B2C marketers need to understand that overseas companies will increasingly use the powerful inbound and content marketing methodology to uncover US opportunities. Stronger offense is definitely the best defense in this case. A business growth strategy focused just on the domestic market is inherently flawed. Growth, opportunity and buying power is migrating to emerging markets. Great marketing can be turned globally as one of two key business develpoment efforts - the other being new markets. When you are ready to internationalize your inbound marketing there's lots to understand - much of it counterintuitive or completely different than domestic considerations. Get great advice to avoid wasting time and money.